Glacier/Island/Storm Week may have come and gone, but it needn't have ended with the last post. The bewilderingly knotting series of posts could be continually spliced with more projects and more commentaries. There's no reason why everyday can't be Glacier/Island/Storm Day. In fact, this sort of multi-blog symposium needn't augment just Geoff Manaugh's curriculum at Columbia, as one could dispatch an artificial glacier or a replicant island or Zeus aerosolized into a horny cloud to infiltrate other studios of other departments of other schools. 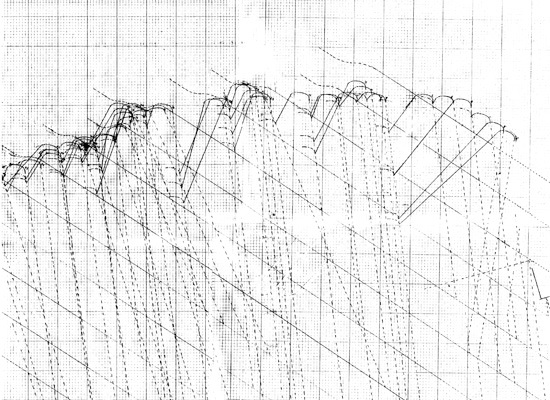 With that said, here then is Sea Change, or impending dune, Kristin Schuster's marvelous proposal for a beach access infrastructure on Galveston Island, Texas. 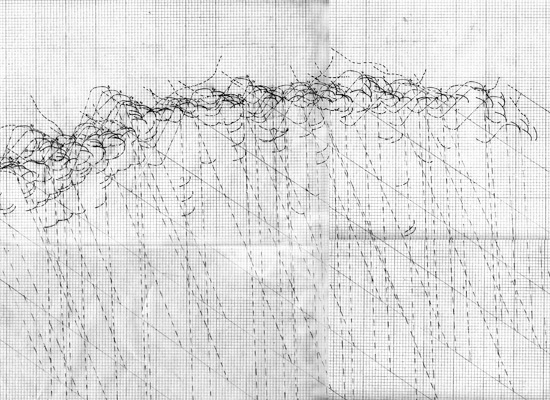 Completed in 2003 as her master thesis project at Rice University's School of Architecture, Sea Change was later published in the 7th issue, titled Landscape within Architecture, of the then twice yearly journal, now annual book 306090. Rather than summarize the project with cursory commentary and strategic blockquoting, Schuster's article, with the kind permission of the publishers and editors of 306090, will be reprinted here in nearly its entirety. This is our ur-beach; no way were we going to hack it into pieces. It's probably hard to get a copy anyway, as the issue is out of print and sells for over $100 on Amazon, save one. But before we get to Schuster's piece, it's worth prefacing it with a blockquote from guest editor David L. Hay's introductory essay. For much of the twentieth century, architects were trained to conceive and represent their work as if in isolation. In keeping with the priorities of high modernism, context was acknowledged only in terms of formal and material aspects, primarily as apprehended through vision. When the structured illusions of modernism began to come undone, however, apprehensions about buildings as static and isolated objects quickly emerged in architectural theory and criticism. The qualities of stability and clarity long valued as attributes of monumentality became suspect because of their association with interpretive closure. In other words, the insufficiency of buildings as objects was attributed, in part, to their pretense to the contrary. As shaping influences, rigid ideals of form, structure, and type were abandoned in favor of dynamic conditions, forces, and flows. “Performance” in architecture, long identified with resistance to formal and programmatic change, is now associated with responsiveness, flexibility, and adaptability, on the model of navigation. In theory and criticism, the ideal resistance to interpretation has given rise to an orthodoxy of inconclusiveness in which ambiguity, subtlety, and suppleness are highly prize. Now on to Sea Change. As a heavily developed coastal barrier island, Galveston is plagued by disasters. There is the sudden disaster—the intermittent bombardment of the island by tropical storms and hurricanes—and there is the slow disaster—the alarming rate at which the island’s beaches are eroding. Shoreline erosion and storm damage are treated as separate disasters, even though their effects are linked: the beaches and dunes are the island’s natural defenses against storm effects. Once the economic capital of the Texas Gulf Coast, the City of Galveston is now a struggling tourist town. Potential in the form of property tax revenue from as yet undeveloped land and increased visitor traffic are bringing local government to push for development of nearly all of the remaining open land on the island in the form of second home development on the island’s West End. Although this means increased revenue for the city and county, the foundation of this economy is federal money in the form of subsidized insurance and disaster mitigation funds. These subsidies support high values for the private property that is threatened by the natural events that shape the land. In response, erosion and storms are met with resistive counter-measures that protect private property on the island at the further financial expense of county and federal taxpayers as well as the physical expense of the coastal environment. Traditional protective measures such as the eleven-mile-long Galveston Seawall have been deemed too costly to build and maintain. Geotextile tubes are the latest technology employed to battle flooding and the creeping property line. Intended to replace eroded dunes and protect the hinterland by not allowing the shoreline to move landward, these resistive measures redirect the forces further down the island, causing increased erosion and beach loss in front of other unprotected property. While Geotubes are often billed as beach protection, they function as private property protection. Because sand continues to wash away while the stabilized shoreline ceases to move back, the beach disappears completely in front of these structures. As wave energy is not absorbed by these structures, the unprotected property adjacent to them will erode at an increased rate. 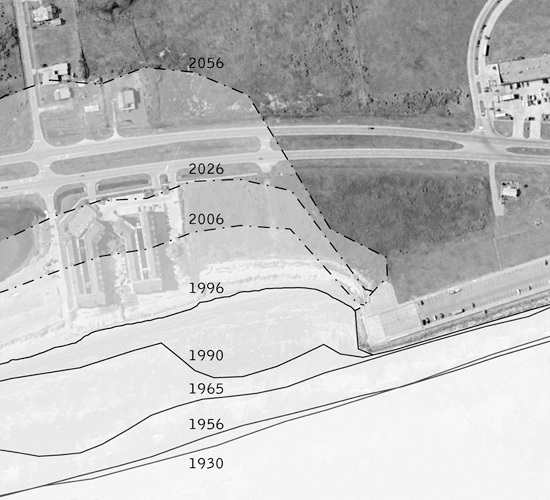 As a result of this process, the Texas General Land Office has designated West Galveston Island, the twenty-one miles of island down-stream of the seawall, a critical erosion area. Due to the channelization of the Mississippi River, which diverted up-stream sand sources, and the development of the Houston Ship channel, sand migration on Galveston Island functions at a deficit of 700,000 cubic yards each year. At the Western end of the seawall, the beach erosion rate is in excess of fifteen feet per year. To counter this, beaches are currently rebuilt along Galveston’s shore through a process called beach nourishment. This is the process of replacing the sand that migrates off of Galveston beaches each year. Not a permanent solution, beach nourishment must be repeated periodically as sand continues to be lost. This process relies on the availability of compatible sand supplies, which are increasingly rare. Mind you, the very property that is disappearing is that which sells for $850 per linear foot of beachfront and generates $34,000,000 in property tax revenue each year. This explains why of the twelve factors considered in the determination of a critical erosion area designation, private and personal loss is considered the most important while public access is third, public safety is eleventh, and human activity ranks as the least important factor taken into consideration. Ironically, the beaches that are sacrificed by these property protection strategies are the foundation of the tourism economy. That private losses currently rank more critically than public access, safety, and human activity is particularly significant considering the historical political relationship between Texans and their beaches. Texas is unusual in that beaches are public (state) property. In 1977 the Texas Open Beaches Act (TOBA) legally established that “the area extending from the line of mean low tide of the Gulf of Mexico to the line of vegetation bordering on the Gulf of Mexico” is public beach. The main focus of the TOBA is to establish unrestricted access by the public to any publicly owned beach, primarily by disallowing construction that blocks access to the beach. While it seems completely unexceptional that private construction not be allowed on public land, the unstable nature of the shoreline in conjunction with the particular legal definition of the public property boundary set up by the TOBA creates a condition of perpetual conflict and struggle between private property rights and public access. The property line is always moving. Buildings that cross the boundary and become partially or fully on public land must be removed. From the perspective of the private property owner, the natural formal cycle of the island is a disaster. The disaster that plagues Galveston Island is the collision between private property rights and public access to public land. The disaster is the economic collision between the forces that have shaped the island and Gulf Coast over thousands of years, and the people who don’t recognize them and thus claim ownership of the land. The disaster is not that the shoreline moves- the disaster is the fact that it is expected not to. The disaster is the perception of the land. This perception is based on traditional models of barrier island formation, which conceptualize the island on a macroscopic scale as a cohesive mass of drifting sand—a kind of solid, if mobile, landmass. The trouble with these timeless abstractions is that they allow us to consider the island in way that causes our structures to be physically incompatible with the landscape. This incompatibility becomes most obvious at moments of disastrous structural failure as houses collapse into the sea after sand is eroded around their foundations. It can also be seen in the struggle for beach maintenance by property rights groups, as technologies based on these models are even further incapable of addressing the ambiguity between public and private. The tools and technologies currently used to design and construct in these environments treat them as fixed topography, as does the legal definition of the land. The primary assertion of the Texas Open Beaches Act establishes a line that is not a line at all. A new concept of the island is required, one based on an understanding of the island as an environment of forces. Such a conception requires new ways of building on the island and understanding what it means to do so. This understanding could lead to economically sustainable tourism-based modes of human activity and presence that directly confront notions of private property rights as currently practiced on Galveston Island. The first step is to engage the processes, and rectify the social relationship with them. This project defines the island as a slurry—a semi-liquid mixture of sand and water in different ratios—rather than as a drifting mass of sand. There is no delineable distinction between the island and the body of water surrounding it, nor between the public beach and private hinterland. The lines of mean low tide and vegetation are ill-conceived as lines. This understanding of the island site gives credibility to the tidal, wave, wind, current, and submergence forces that have been identified as active in island formation by recognizing that they are perpetually active. They are not separate from or located outside the island, but material conditions of difference within it. The tools and technologies exist to work within this concept. 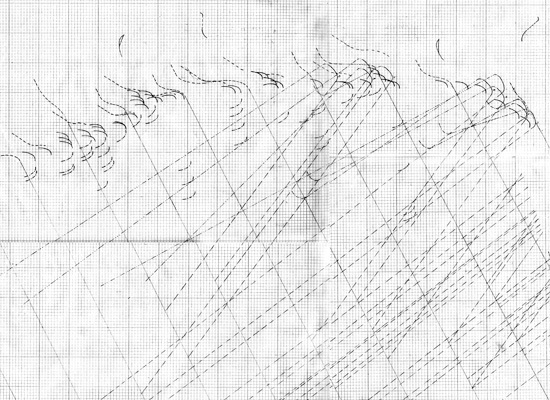 Whereas a topography map renders the site solid, passive, and receptive, a vector drawing models a slurry that is ‘alive’ with actively willful behaviors. By drawing the site as flow and form rather than topographic configuration, vector drawing allows the design to be based on the relationships present within the site which remain constant even as the configuration changes. In dealing with an unfixed site, designing for the relationships rather than the configuration ensures the relevance of the intervention beyond the dissolution of the current configuration. [The opening image plus the two above] reveal the complex relationship between the weather and the landscape as they are traditionally conceptualized. Each is an iteration built on the previous, a rendering of the forces and forms present at the site over one calendar year. More importantly, these drawings provide formal and operational implications for the proposed system of beach access, as well as the foundation for a three-dimensional cad drawing process to test and represent the final design proposal for beach access. To recognize that the landscape is active gives new imperative to the act of intervening. To intervene in such a site is to harness the activity of the site, redirecting the energy of the slurry to effect the desired change indirectly. The landscape will do the work. The intervention must remain viable in the kinetic environment, and it must be flexible enough to ride with the slurry. In other words, it will function at the level of the relationships within the slurry, and the relationship between the slurry and humans. Meshes are the ideal structures in such an environment, having both structure and flexibility. A mesh with inherent structural properties, such as a pleated textile, will support the functional interests of human activity while strategically mediating the behavior of the slurry. The flexibility of such a mesh is limited by the size of the pleats and their orientation in relationship to overall size of the piece of material. Thus, for the scale of application relative to the scale of the pleats necessary to give the given material structure, a panel size can be determined. The use of a panel system allows for added flexibility in the deformations, and strategically controlling connections between panels and layering of different material types can add greater sensitivity to specific conditions of the slurry. 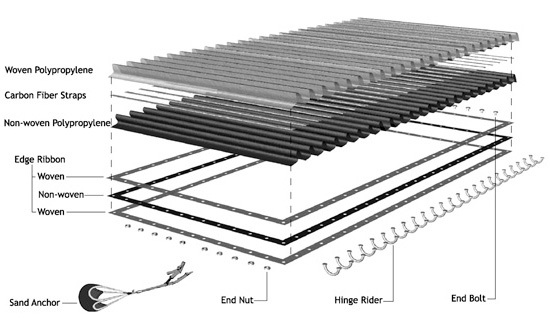 The proposed beach access infrastructure takes the form of a system of geotextile panels in order to take advantage of the natural abilities of a mesh to strategically mediate the behavior of both people and a slurry. There are three panel types, each of which corresponds to different conditions within the slurry. Each panel corresponds to a zone of the site, and is able to mediate the slurry and human circulation in the specific ways noted due to construction of the layered section and combination of the materials used. Each panel is anchored in the slurry at only two points, the center of the short edges. As a result, the panel is able to radically deform to accommodate the current configuration of the landscape and the total panel construction in order to remain viable as a system of beach access that is traversable by humans. 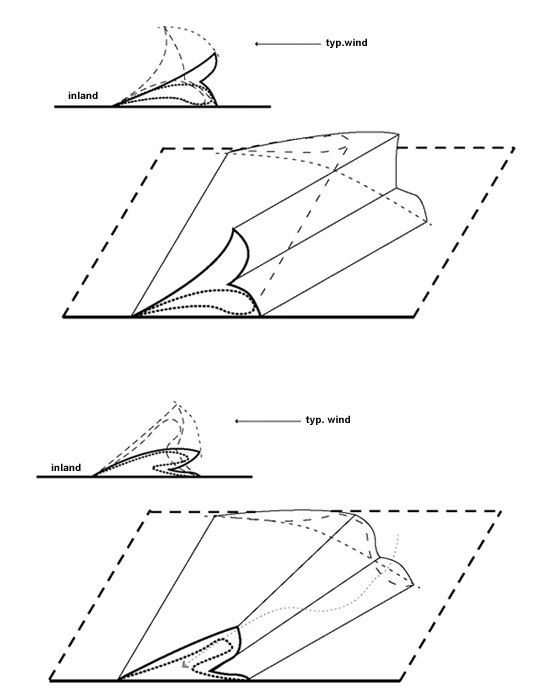 The combination of unidirectional pleats, spring straps, and a dimensionally stable edge ribbon create specific deformational behaviors that both impact the smoothness of the resulting configuration and add significant sectional characteristics which mediate and channel circulation at another scale. As paths are no longer traversable, new panels must be connected to the system. The result is a constantly configuring system of pathways that operate according to the physical principles of the ecology rather than the territorial logic of human occupation. The pathways literally blur and stretch the legal boundaries of the site. Physically, the system allows the forces present to be productive of dry beach and dunes as sand is scooped up and channeled inland. Without the system installed, the beach will not exist, having been sacrificed in futile attempts to halt the erasure of the private property inland of it. Without the beach, the island’s $350,000,000 tourism economy would suffer. Politically, the system inverts the current set of priorities which value private property rights over public access to the beach. Due to the physical effects of the intervention, beach access would become a desirable element on private property, whereas now it is often illegally removed or obscured by private property owners wishing to exclude the public from their land and vistas. Fundamentally, the system makes the workings of the forces within the landscape visible and serves as a marker for the work they can do. Erosion is transformed into a productive process as island change becomes real in the popular concept of the place. By upending the popular conception of the coastal landscape, this project lays a path for dialogue about building technologies and land-use policies more appropriate in a fluid landscape.